Bean Bag Chairs represent the ultimate in Retro-Chic and we created this guide to help you choose which one is right for you. We looked at things like materials, affordability and color choice and put them all together in this handy guide. Check out the following Quicklinks in order to navigate to the right bean bag chair according to your needs! Where to Buy your Bean Bag Chair? Q) Can Bean Bag Chairs actually help adults who suffer from back pain? Q) Is your bean bag chair safe? Q) Don’t they break fairly easily? Q) Does it come with a warranty? Q) Can I use a Bean Bag Chair outdoors? Q) What are the benefits of using a bean bag chair? Q) Which material should I use for the stuffing? Q) Which material should I choose for the outer layer? Q) How often do they need a new filling? Q) Can bean bag chairs really help babies with Colic? Q) Are bean bag chairs suitable for gaming? Q) Should I buy a small or large bean bag chair? The Chill Sack Bean Bag Chair came out as best overall, representing good value, great quality and a comfort level others struggled to contend with. This chair is a huge model at 60 x 44 x 30 inches – enough to sink into and relax – even if there are two of you. Additionally it has shredded memory foam pieces packed in there to help you sink and is big enough for both kids and adults. The finish is a removable microfiber, machine-washable suede coverlet that adds to the plush texture. This model is made entirely in the USA. We loved the size, the texture and the way this bean bag chair envelopes you. It is fabulous value for what you get and makes the best bean bag for adults, the best bean bag for kids and the ultimate bean bag chair for gamers. At number two we have the best bean bag chair to buy for under $100. 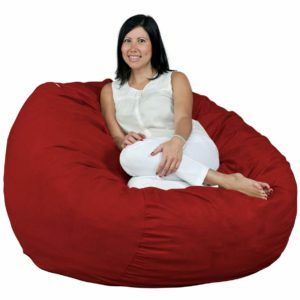 This Cozy Sack Beanbag Chair represents the ultimate in choice, style and color variety. Available in as many as 15 different colors you are sure to find one to match any room from this brand; for an affordable price, too. Cozy Sack use Centripur-U.S. Certified pillow quality foam shreds that envelope you in comfort and allow you to sink fully in. The cover is machine washable and the whole thing will arrive vacuum sealed. Once everything is fully expanded this bean bag chair becomes one of our best buys. If you want a good quality, long lasting product that you seek to match to a particular color scheme, or if you want to buy multiple bags of the same color, then this is the brand we recommend. Third in our top three is the best value chair for under $50. 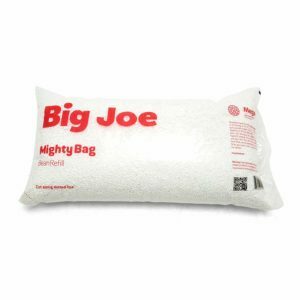 For those of us shopping on a budget you can buy the Big Joe Dorm Bean Bag Chair. This smart number comes with a few color choices but, and much more importantly, includes an elastic mesh holder for your beer bottle and a pocket for your technology. At 32W x 25H x 33D this chair is big enough to sink into and affordable enough to buy multiples, if you so choose. The cover is removable and sold separately. Furthermore they use their own patented UltraMax beans to fill the bag. If you are looking for the best in dorm room bean bag chairs then this model is what you need. It has highly durable double-stitched covers and is made with SmartMax fabric. 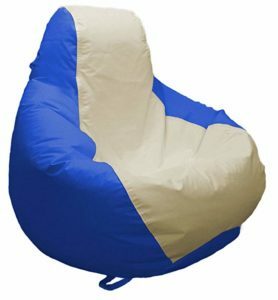 (especially designed to be tough) Suitable for the rough and tumble of any common room, this is the cheap dorm bean bag chair most students want. The Jaxx 6 Ft Cocoon Large Bean Bag Chair by Cinnabar represents the top of the list in luxury bean bag chairs for adults. The Cocoon is more than just a chair, it’s a ‘crash pad’ too. It folds out flat in order for you to lay down on or it folds up into a chair for you to lounge on – either way it shows the maximum in comfort! The fabric cover has a suede feel finish but it’s base material is polyester. This allows for cheaper production material that retains the fine finish. The soft textured cover is easy to remove and machine wash. The beans used inside are of polyurethane foam. It is 72L by 72 inches wide and stands 20 inches high. When it comes to luxury bean bag chairs that are affordable and dynamic, this is an excellent choice. The before mentioned Chill Sack Bean Bag Chair comes in second in our top three best bean bag chairs for adults. 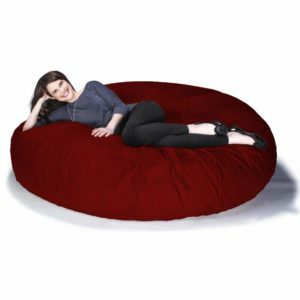 Available in eleven different colors and 60 x 44 x 32 inches in size this bean bag is big enough for two to cuddle in. It is made from shredded memory foam and has a removable and washable cover. With so many colors to choose from and a great, cheap price to match, this chair is will match any space you add it to. Chill Sack is probably the most popular brand in the industry, using double stitched micro suede fibers for a soft but durable finish; they make all of their bean bags at home in the USA, so you know your carbon footprint is always kept to a minimum. If you want one big enough to cuddle up in that comes at an affordable price and looks suave and stylish, consider this model. The BeanBob Bean Bag Chair – 4FT comes in third on our list of top three best bean bag chairs for adults. These chairs come in a variety of patterned, colorful and sophisticated designs that will look great if you can match them to your furnishings. For something a little different that still adds a touch of chic we thought these chairs were awesome. This chair has measurements of 120cm x120cm by 120cm, which means it will stand about a meter tall in your home. It comes with a removable and washable cover and a spongy inner center made of high quality foam. The finish is soft and luxurious and is also double stitched for durability. 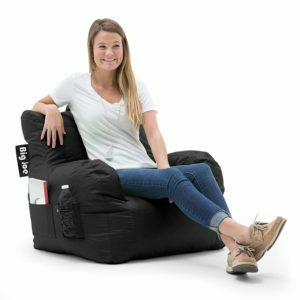 This bean bag chair is one of the best for adults because of its sophisticated feel, but you could also use it for dorm rooms, gaming chairs or other areas of the home. The Creative QT Bean Bag Chair for Kids is number one on our list. 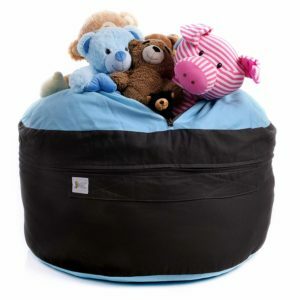 Available in lots of fun colors and designs this is more than just a bean bag chair – it is also a storage compartment! This ottoman opens up to reveal storage space for up to ninety stuffed toys – so you can give them somewhere to sit and something to put their furry friends into! 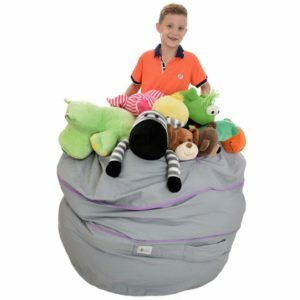 As well as representing the height of versatility, this bean bag chair for kids makes tidying up into a fun game. Stuff the animals away and sit down before your siblings do for a prize. The colors are creative and youthful and the design itself is child friendly and comes with a lifetime warranty. We can’t ask a manufacturer for much more than that and we love this product as our number one bean bag chair for kids. The Smart Wallaby Jumbo Storage Bean Bag Chair for Kids is a close second due to its dual function as a storage and chair. Available in four unique and fun designs this brand has a patent pending for the idea of the dual storage space and bean bag chair idea. It measures some 31 inches – the perfect size for little ones – but it is fully expandable and the more you stuff it the more fun it becomes! This product is affordable, comes in fun designs that will please most children and expands to huge proportions to accommodate storage to a whole new level. We love the double stitched seams that stop it bursting, the huge size of it and the 100% cotton canvas cover. Overall this is a great choice of bean bag chair for children. Smart Wallaby also occupy our third spot with their Expandable Bean Bag Chair with Blankets. This model comes in a choice of three designs that are slightly more stylish and upmarket than their previous four offerings. However don’t worry it still retains that marvelous expandable feature that makes them double as a storage unit. This cylindrical version has all the double stitched, full cotton goodness of the other four but it is rounded and comes with a no-risk 30 day full refund guarantee if you are not satisfied. We love that they have presented these bags in gender neutral colors to allow for a greater variety in their produce. This soft toy storage system is also perfect for nursery blankets and winter storage, and will make an excellent piece of furniture in the room of any growing child. We call it a sound investment indeed. 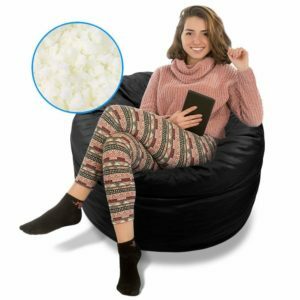 The 3Ft BeanBob Bean Bag chair is marketed as ideal for both children, adults, and everyone in between, and we agree enough to place them in our top spot for the best bean bag chairs for teens. With fifteen different colors, styles and patterns to choose from you are sure to find a match for any space. Not only that but it also has the machine washable outer layer that we have come to love so much. 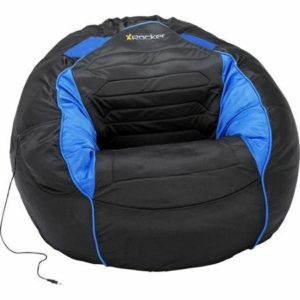 These bean bag chairs are double stitched with a tough and durable outer zipper that is designed to last. They have dimensions of 91 x 91 x 91 inches; that’s not quite the adult size but still big enough to comfortably sit one. This bean bag is perfect for dorm rooms, games rooms, comfortable lounge furniture and bedrooms alike and we can’t recommend it highly enough. 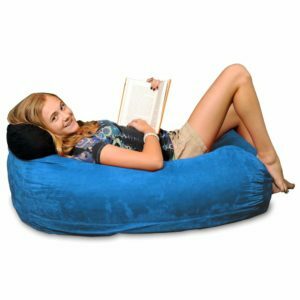 The Chill Sack Bean Bag Chair in Large is ideal for giving your teenager somewhere to lounge around. Like all of the Chill Sack range, this bean bag chair sports a durable, double stitched cover made from a soft blend of microfibers and is filled with shredded memory foam that is designed to envelope you as you sit and contour to the shape of your body. At 48 x 22 x 22 inches this soft and over-sized lounger doesn’t sit upright like the adult models, rather it was built to lie down on – making it the perfect accouterments for any bedroom. That being said teens especially love the shape and design and the size isn’t too overwhelming. It is also one hundred percent made in the USA so you won’t pay through the nose for shipping, either. 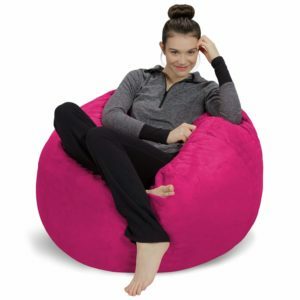 The Cozy Sack LG CBB Cinnabar comes in third on our list of best beanbag chairs for teenagers. This bag is available in a whopping 20 different color and style combinations, meaning that your teen will have as much choice as they like. This is an affordable beanbag chair that is cheap for the amount of beanbag you get! Made from 10% microfiber materials and with dimensions of 40 x 40 x 40 inches, this chair won’t take up too much space. Cozy Sack are an all-American company that have been providing quality products since 1971; so they know what they are doing. This affordable model is no less worthy of admiration than some of their more expensive ones – and it looks brilliant in any bedroom, to boot. 1) The Kahuna Sound Chair Bean Bag tops our list for this round, thanks to its in-built speakers and easy connection to so many different gaming consoles. It has a stylish blue and black racing theme that should accommodate the gamer in you. Moreover it has a wipe clean vinyl cover and a durable array of fabric and zips to ensure longevity. The innards are made of polystyrene filling. Since this bean bag chair for gamers comes with a headset and controller to match, and has no need for removable coverings partially because Kahuna know their audience very well. It also connects to your iPod, iPod, DVD and other devices, allowing for a seamless playtime experience. We think this bean bag chair is the perfect fit in any games room, anywhere. 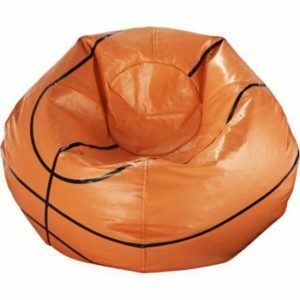 The Basketball Bean Bag Chair for Gaming is fashioned with a unique and interesting basketball design on the cover. This is a cheap and affordable model that is dual lined like its predecessor and only needs a wipe to clean it. This model is cheerful, making the perfect design for young gamers with a passion for sports. It is big enough for a teenager but not to comfortably seat an adult. Additionally it does sport a fantastic design that doesn’t stain, tear or get soaked easily. The vinyl cover adds a little waterproofing to an already solid model. If your child enjoys basketball then this is the model for them! As if this item on its own weren’t enough, the same manufacturer also provide other kids/teenagers basketball themed furniture like rugs and tables… head on over and check them out. The Inverlee Giant Bean Bag Chair arrives a close third in our best gaming bean bag chairs list. This model is available in five different colors and is huge enough to swallow your average adult whole. Poly fabric with high stain resistance makes up the outer cover of this bag making it both wipable and waterproof should you spill your tea while shouting at the screen. It stands at about 140 cm tall though, so be warned that this bean bag chair will require a bit of room all to itself. Perfect for the dorm or games room, this bean bag chair has a concealed zip so that it won’t damage your flooring. We love the size and the price; but you should be aware that filling is sold separately for this model since it is just so very large… the shipping costs would be extravagant, otherwise. We found the A2S Protection JoyBean Bean Bag Chair to be the best overall in the waterproof category. Not only are some bean bag chairs for the garden, but some are made especially for boats – just like this model. This model offers a teardrop sort of shape that has been ergonomically designed for your comfort and for easy maneuverability. It has been made completely in the USA using specialist marine-grade waterproof fabric to make sure it can handle all seasons. This bean bag chair is UV, water, mold and mildew resistant and comes with a lifetime guarantee. It is also available in a whole range of colors and sizes, all of which are designed to look great by your pool or on your deck! The whole product has been double stitched with heavy duty, waterproof yarn and you can’t ask for much more than that for an outdoor-proof bean bag chair, can you? 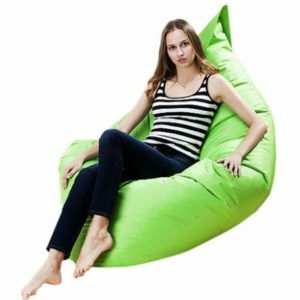 The Sofa Soft Plush Bean Bag Chair has been explicitly crafted with students in mind. Soft and fine, this model sports a whole host of colors, are touch-ably soft and are made from memory foam innards which help envelope and comfort you in a welcoming embrace. These stand about 24 inches off the ground and, unlike the larger counterparts, are only suitable for one person at a time – but whether they want to sit or lounge the choice is theirs. In case you were wondering, this product is every bit as soft and luxurious as its name suggests. These are simple bean bag chairs done in the retro style and made to be easily portable from one place to another – a must have in any dorm room. Not all chairs come fully stuffed and those that do are liable to degrade over time. While companies spend millions on research solving this problem by inventing the perfect bean; in the meantime we sometimes need to buy a refill… especially if your bean bag chair has met with any accidents. In this case we picked out the best quality material for refilling that we could find. Big Joe Comfort Ultima X present the best bean bag chair refills on the market. You can buy 100L of bean bag contents for less than $20 so actually, even if you do buy a bag you need to stuff yourself, the cost doesn’t mount up too much. These are virgin polystyrene beads that will last until your next refill plus, with 100L in the bag and an average large bean bag chair volume of around 60L, you are going to get very good value for your money. There are a large number of beanbag chairs on the market and which one suits you all depends on what your are looking for. Do you want leather or fabric? Do you want to be high up or sprawling? Would you like a bean bag bed, perhaps? We took a look at some of the best bits and put them all together in one place. How do you intend to use the chair? Is it to decorate a space with or is it going to be used everyday? Is it intended to form part of your garden furniture or is it going to live indoors? All of the aspects of how you intend to use the chair need to be considered before you buy. You wouldn’t want a hardy polyester waterproof chair to lounge and play video games in, nor would you want a plush faux fur chair to decorate the garden with. Use your better judgment and you should be fine. The style and design of your bean bag chair is are comprised of the materials used to make it, the colors featured and how high quality the overall product is. Materials have the ability to affect the price of your chair. If you want to go for a high fashion or bachelor pad-esque feel then leather is always a good choice. It looks suave, it fits into most rooms and it adds a touch of elegance that other materials don’t quite meet. For an alternative rich and luxurious feel you might consider having a bag cast in faux fur, adding a plush layer to an already comfortable chair. Bean Bag Chairs come in a variety of shapes and sizes – but it is the plethora of choice you have when it comes to color that makes them such a unique and interesting design point. There are so many colors to choose from on the market – and you can even have them custom made if you can’t find one that suits you or your space. Finally, the best way to check whether or not any bean bag chair you are thinking of purchasing is durable enough is to scroll right down to the customer reviews at the bottom. If other customers swear by it, say it is a good make and have had it for years then it is a reasonably safe assumption that you will get many years of love out of your chosen bag. If the customers are warning you not to buy it get out of there and try somewhere else. If you are willing to invest a little extra you might even find a brand that comes with a guarantee… and we would always recommend that you choose a guarantee or warranty. You may recall back in 2014 when a major manufacturer had to recall some 2 million bean bag chairs after two small children crawled inside them and suffocated. Nowadays measures are taken to prevent this; but if you have small children you should be aware of the dangers. Nowadays almost all fillings and fabrics used by manufacturers are deliberately non-toxic. That being said, the best way to prevent accidents is to always buy a beanbag chair specifically designed for children, or to at least buy one that comes with an outer cover and a lined bean bag that the children cannot get into. Bean bag chairs come in a variety of different shapes and sizes. The huge ones can hold around 70L of material but some go all the way up to the full hundred. You can get small, child-sized bean bag chairs or huge ones big enough to fit two adults on. In the case of some they even double up as storage for soft goods like blankets and towels. These have less beans inside but can expand and double up as a way to keep rooms tidy… particularly for younger customers who need somewhere to stash all the soft toys they have! Bean bag chairs come in all different shapes. Some are fun and funky, shaped like animals or themed; others are sophisticated and eloquent. Some have backs while others are designed to be lounged upon, and a small selection of them are adjustable to either preference. You can get a round or a square bag, a bean bag chair with cup holders, pockets and actual armrests; or you can have the traditional, round-blob-dropped-on-the-floor shape that was exceedingly popular in the 60’s. The better quality the bag and the construction materials used, the better the bean bag chair will keep its shape over time. There are a variety or different fillings out there and, relatively speaking, they are all pretty safe by comparison to the old retro bags. Nowadays shredded memory foam might be used in the higher end models, or some other derivative of polyurethane bead. They might still contain polystyrene pellets, or actual dried beans (though this is not common in modern manufacturing). Alternatives are PVC beads or expanding polypropylene… all of which have the rounded feeling that should contour to your body. If you are worried about health and safety aspects then choose a double lined bag with a concealed zipper for extra security. In the case of beanbag chairs the contents can be beans or memory foam, the giant bean bag chairs tend to be filled with memory foam just because of the size of them. This is long lasting and hard wearing, and shouldn’t need refilled often. The bean bag covers are always a high grade material like suede or imitation microfiber suede. Nobody wants a huge beanbag with a low quality fabric finish. Comfort is obviously at the top of your mind when it comes to buying the best bean bag chair for you. The comfort level of your bag will be determined by a number of factors. The beads inside can be either hard or soft depending on your preference. The fabric that the cover is made from can be touch-ably soft microfiber or suede and might even be slightly cooler vinyl or unforgiving polyester. All of these factors will depend on your own preference and price range, so make sure you read this guide thoroughly so you are getting the best value for money. Colors range from sophisticated beige to multicolored, patterned striped or even themed. If you want a children’s bean bag chair then the color range becomes even greater. Furthermore you should be able to buy chairs to match any décor you want to and you ought to be able to pick up a stylish pattern here and there if you look. When it comes to color there is no limitation, you can have anything under the sun. Covers can be made of many different fabrics. The vinyl or leather finishes are generally wipe clean and some won’t even need to be removed. Not all covers can be removed and washed, so bear that in mind when you buy. Your beanbag chair should come in two parts, with a lining bag containing the beans and a cover that you may even be able to swap around to liven up the décor. Fabrics such as full cotton and less durable materials might look better in the living space, but they won’t last as long as the more durable stuff. So choose a good cover from the outset and don’t be disappointed. It is important to think about how much you are willing to spend before you rush out and buy the bag of your dreams. Some models are priced to accommodate for longevity and durability of materials, some are priced simply to sell. When it comes to bean bag chairs you really do get what you pay for, so be careful… it just might be that what seems to be a good deal ends up with scattered pellets bursting all over your living room floor. Proceed with caution and save a little longer if you have to. It is also worth noting that the cost of your bean bag will directly relate to the size of it. It is much cheaper to buy a bean bag chair for a child, for example, than it is for a grown adult. The price will increase the more bean bag you buy, so if you do decide to go all out and buy the bed you will end up paying a costly sum for the privilege. That being said, affordability does not always mean quality, as we covered above. The best thing you can do is to decide how much you are willing to pay and then be consistent. Do not exceed your budget and, if you need to, simply save a little longer to get the better model. Quality isn’t always cheap, unfortunately, but you shouldn’t stop looking for a good bargain! Maintaining your bean bag chair ought to be a fairly simple process. If the fabric is waterproof, vinyl or leather the chances are it wipes clean, although some of these types can still be removed to machine wash. Most bean bag chairs nowadays will come with a detachable coverlet so that you can properly clean it once in a while – but not all do, so be wary when purchasing if this is something you want. You may also notice that your bag gets a little softer over time. This is normal and it just means your bean bag chair for adults needs a little refill. Unless your manufacturer expressly states that your bean bag chair won’t degrade over time then this will be the case. On higher end bean bag chairs you won’t need to do this. Like with most things in life you will get what you pay for. There are a number of cheap bean bag chairs out there that won’t last very long and rely on the fact that you will replace it in a year or two. The more high end bean bag chairs are not so, and ought to come with a guarantee or warranty to assure you. Durability can be improved so look for a model that has double stitched lining or sealing, has a hardy zipper that is preferable concealed for protection and that has a tough outer finish so that it won’t burst. As we mentioned before, the safest bean bag chairs for children are the ones that you cannot open. This prevents suffocation risks because they can’t climb inside the bag or open it to swallow the beans and choke. In this instance you need to choose a washable or wipe-clean bag so that it never gets bacteria laden. Even then, children should be educated that the bean bag chair is not a toy but an item of furniture, and is therefore not to be used in sibling fights etc. Amazon have the widest selection of bean bag chairs and established manufacturers so we would recommend them as our immediate choice. You will find the best array of colors, shapes, sizes and varieties on their website. Ebay comes in as a reasonably close second and you should be able to find what you are looking. The choice will be slightly narrowed and you won’t find as many deals direct from the manufacturer; but the prices are similar. In either store you should be able to find what you are looking for. The traditional office chair presents problems that the bean bag chair simply doesn’t have. It might twirl on an axis, it might have wheels for mobility – or it might just be a standard chair in the interview room, used for holding rigid staff meetings where the occupants are all secretly thinking about what they are having for dinner when they get home… In any case office life could be much improved with the introduction of the bean bag chair as standard. Bean bag chairs are a unique, interesting and fun way to perk up those meetings. The psychology is actually very simple. When everyone is lower down and closer to the floor they are all on the same level. Therefore, when you have a bean bag chair meeting employees are more receptive, open to ideas and more likely to produce better results. Apply this to the broader office environment as a whole and Bingo! Suddenly nobody minds a Monday morning quite as much as they used to, meetings grant better results and people are working later because they forget about the time. A more relaxed, comfortable atmosphere is the key to a productive working environment. When you rely on a regular chair you are forced to remain in one position for long periods of time and this is the leading cause of back, neck and head pains in the workplace. If you switch the office chair out for an adult’s bean bag chair you are able to shift positions easily and often, preventing this build up of cramp and muscle ache. Not anymore! Maybe in the 60’s! Nowadays they are made from tougher, more durable materials that are designed to last. If you buy a poor quality bag from a shoddy supplier you might be left with a dodgy product, but if you follow our guidelines in this document then you shouldn’t be caught out and your bag should last for a good few years. Some of them do and some of them don’t. Be sure to check when you are looking at new bean bag chairs if a warranty is something you would like. As a general rule, the high end bags and the child-friendly ones tend to have warranties to assure you of their safety and quality. We would always recommend buying a product that comes with such guarantees. Selected models have been specifically designed to live by your pool, out on your porch or absurd your boat and exposed to the elements. These are usually made from leather/vinyl/waterproof material mixes and are designed to withstand the weather. You will pay a little more for the privilege but they will look fantastic, wipe clean and be sturdy for years to come. They are tremendous fun! Asides from which they are very chic, on trend and totally comfortable. As well as the style and adventure benefits they are good for your posture, present a comfortable and relaxing space and are easily transported from one room to the next. Unlike most chairs you can remove the covers and wash them… what’s not to love? You can buy refills on any type of material you like – but it is best to go with what the manufacturer originally used to stuff the bag with, otherwise you will compromise your comfort level by having mis-matched beans. Common fillings include PVC beans, shredded memory foam and expanded polystyrene, but there are many variants out there. This depends entirely on the look, color, style and theme that you prefer. If you want to put it outdoors or in a kids room make sure you wipe the material clean and opt for vinyl or leather. Polyester is lighter but can be adapted for durable outdoor use or for bean bag chairs for children – but adult bean bag chairs tend to be made from microfiber and suede, cotton or other plush, soft and rich materials that invite you to sink in. Some of them might never need filling up ever again so check before you buy. Some bags are sold without any stuffing and you will need to purchase it separately. A good quality, pre-filled bean bag chair ought to last for between three and four years before you refill it. When you refill you should remove the old beans and entirely replace them for the best effects. Yes, and not only that but they are a tremendous help to babies born with flat-headed syndromes. The bean bag conforms to their shape and supports their posture no matter which way they move. Colic is made worse by the infant having to hold up its limbs and head on its own so when you take this problem away it provides a more relaxing environment in which they can recover. Bean bag chairs are literally the best chair for gaming that you can buy. It adapts to your body position and won’t hurt your back or buttocks during long sessions, it doesn’t require you to adjust it at any point and therefor doesn’t interrupt the game play and some of them even come with built in headsets, connectivity to your favorite console and pockets to keep your controllers in. The choice is yours, but what size you need will greatly depend on how you are going to use it. If you are buying a bean bag chair for a child then a smaller model is acceptable. However, if you are buying for adults or for the office then the bigger the better! Bear in mind that the price will increase alongside the size and also that some models are expandable. …There are a wide range of bean bag chairs available on the market. Some are cheap, some are expensive, some have memory foam and some still rely on plastic beans. You can buy any color that you can think of in a huge choice of designs and patterns that will match and brighten any space. They are perfect for creating a relaxed environment and for updating a boring or old feeling room. Most models are safe for children, but we still recommend buying a child-friendly version if you have youngsters in the house. It is better to be safe than sorry. We hope you have enjoyed our Ultimate Guide to Bean Bag Chairs and that, through using it correctly, you are able to find the perfect bean bag chair for you. Be it big or small, sophisticated or charming, the choices are endless – and they are all yours. If you would like to support us please share this article and help use reach more people so that we can find them their perfect matches, too. In the meantime enjoy your purchase. Isn’t it so much nicer now that you know you have made an informed decision?